The Parthenon group, whose mission is to be the strategic advisor of choice for CEOs and business leaders worldwide (Case Studies) came out with a report titled Financing Indian Higher Education during the EDGE2011 conference. So did Ernst & Young, with a report called 40 million by 2020: Preparing for a new paradigm in Indian Higher Education, building on its earlier report with FICCI a couple of years ago. Another interesting report, which is as old as 2003 and created by All India Management Association, the Boston Consulting Group and Confederation of Indian Industry, is titled India’s New Opportunity – 2020. There must be many others. It starts with the argument that Higher Tertiary Enrolments imply a more educated population. A more educated population implies a more productive workforce. A more productive workforce implies growth – higher GDP per capita. It uses World Bank statistics to, however, show the reverse chain of logic. A higher GDP per capita is correlated with higher Gross Enrolment Ratios (steeper in countries like Brazil and India and flatter in the USA and UK). With 8% CAGR economic growth projected between 2010-2016 as the main driver, it projects that tertiary enrolment needs to increase capacity by 50% to 8.9 mn by 2016. Next, the report looks at the distribution of income and the affordability threshold. 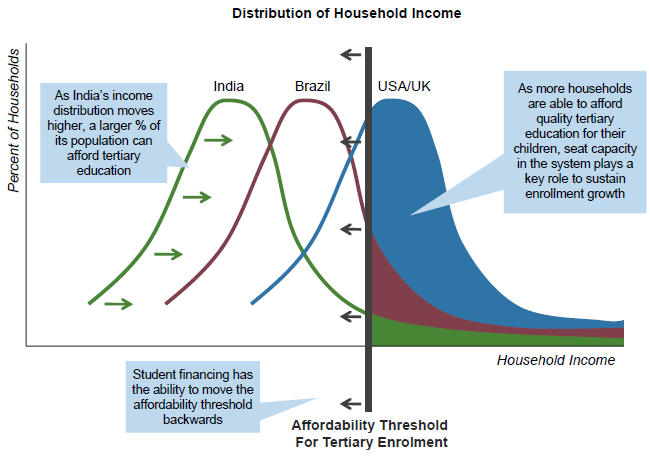 The Parthenon report draws a single vertical marker for household income showing that currently tertiary education is affordable for just the long tail on the right – the highest income households. This is an incorrect perception. 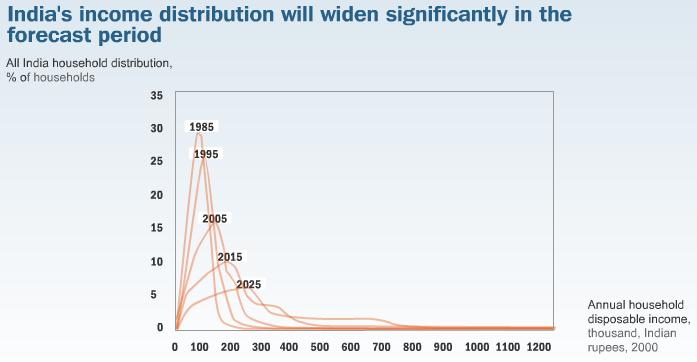 The Bell curve in the report also seems to be incongruous for India – a more reasonable picture is painted by McKinsey. To preserve the growth story, student financing has the ability to move the affordability threshold backwards, is what the Parthenon report says. The differences by levels of education are more striking. On average, a household has to spend Rs.501 per child per annum for primary education. If the child goes to middle or upper primary education, it increases to Rs.901; it further increases to Rs.1577 in secondary schools and Rs.2923 in higher education. Education on $10 to $60 a year (1995-96 levels) budgets is a vastly different problem. The Planning Commission report actually points out that households end up paying most of this budget for textbooks, uniforms and private coaching apart from fees; when these items are expected to be free and uniformly available at the right level of quality. The Parthenon report compares costs of tertiary education between the USA and India and finds that it is more expensive in India for every income bracket. I paid a few hundred rupees for each year of college education and find this cost difference hard to believe from any perspective (even if were to consider reasonably expensive engineering undergraduate courses costing a 10,000 USD packet for 4 years of training). The report describes the fact that broad financing options in the USA help get low income students access and paints a shocking picture of how advanced the USA is with multiples ranging from 5 to 45 times the number of students in higher education as compared to India. The subtext is, of course, that financing helped that miracle happen. The next slide states that the reason that many low income students cannot attend college is that they rely on precious family funds – if the family cannot afford it, they can’t go to college. The solution, that the vast majority of India should take on private educational debt to move these budgets up, is a catastrophic suggestion, even if feasible at any level. But the Parthenon report goes ahead and does just that. It presents three options available to increase access to tertiary education in India. Now, having made the argument – growth requires increased tertiary enrolment which requires households to spend money, which they do not have; which means they need to bump up their funds; and what better than to let the market in – its time to substantiate how the tertiary enrolment in the USA actually grew out of student financing reform between 1955-75 (is that true?) which led to capacity expansion in the next twenty years and is now seeing a capacity utilization phase with enrolments growth rate (private sector contributing to the tune of 7 times the growth of public sector education) rising in excess of capacity growth. To be fair, the report talks about two concerns of student financing – that institutions have increased real tuition levels based on demand and what they can get, and, the issue that private schools want to make money & are less worried about student outcomes. The panacea they specify is the role of oversight to be played by the state. Strange, bring in the market, get government to help it make money, let it make great money, then start rooting out the low hanging competition on quality grounds using state power? And then comes the solution. There are significant problems today. We need to raise awareness, make the process simple, relax current terms (make institutions co-accountable as in the USA) and many other things we could do better and learn from the USA in handling loan processing – basically improve demand and supply factors to develop an efficient financing system. Why am I being difficult? Obviously, we have to find funds to seed the system to meet the challenges, but how? Federal student loan debt outstanding reached approximately $665 billion and private debt reached approximately $168 billion in June 2010, for a total student loan debt outstanding of $833 billion. Total debt is increasing at a rate of about $2,853.88 per second. The amount of new debt has increased every year from 2001. In 2001 additional debt was 29 billion but by 2009 this had more than tripled to 99 billion. Take a moment. Look the student loan debt clock and read this If you thought the housing bubble was bad. My second problem is that India is not the USA. We are different, in case nobody noticed it yet. We cannot compare with what works in the USA or UK. The analysis and solution are all about that comparison. What works elsewhere may not work here. My third challenge is that the report is about the end justifying the means. Everything is backward, leading from the conclusion that financing is good because it really makes money for those who have it. And the argument is not put together with care, even if that is the belief. For example, it makes the assumption that we are the most efficient spenders of government money on education. It makes the assumption, the really bad one, that we know nothing of student debt problems in the US. And many more such assumptions. My fourth challenge is the numbers. Our scale is far bigger than what the USA faces. USA has 83% Gross Enrolment Ratio in Higher Ed with 18 mn students. We have a GER of 12% and we are at 16 mn students already. A drop here is an ocean elsewhere. We can create monsters many times the size of the housing bubble in the US or create a benign superpower by making some fairly simple decisions now. My biggest challenge, though, is that most people will look at this and say it is probably the right solution. If government can’t pay and the vast number of students are suddenly able to pay for education that is obviously too expensive for government to bear the cost of, then the only solution must be to fund it in another way. Or they will hide behind other excuses, saying teachers are so underpaid (and in great shortage) and the infrastructure is so bad. Its time we stood up and tackled our problems the hard way – and there is no other way to do this that is right. We have enough smart people and enough money to work our way through these issues. And we have many friends in countries all across the world that are dealing with similar problems and would love to help and be helped in the process. Next post: A look at the E&Y reports. Game changers for Indian education. I think this is a key challenge, not only in India, but across the world. It is every bit as important as the quality of educational technology and content in our classrooms. I am, so far, largely untouched by what I see in India (and maybe I have limited experience). The first problem, and the most important one that I see, is the lack of open dialogue. Yes, we have conferences, retreats and closed door discussions where people sit together and make policy or strategy. But these are only that – closed and non-transparent. We need a system that encourages dialogue. But not in the way handled traditionally viz. by stating platitudes like comments are always welcome and it is a big challenge and we need all the help we can get. We need a concerted effort to create academic and professional spaces for educators which brings down barriers and allows at least the new generation to explore the issues, deliberate on them, propose specific solutions and generate consensus. The starting point will be to do a volte face and state that we do not understand the problems, far less the solutions. The mindset today is that everyone is an expert in educational matters in India (and some probably can hold this claim). But like in all crises, there will be key influencers who, through popular media, will shape the popular opinion. Today’s news provides a lucid example of what I am trying to say. 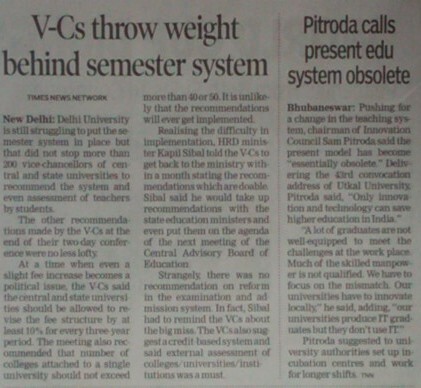 The piece on the left talks about a group of 200 central and state university vice-chancellors pulling their weight on the implementation of a semester system and an assessment of teachers by students. The writer’s opinion, substantiated, h/she claims by the HRD Minister, Kapil Sibal, is that these suggestions were lofty and the minister recognized the difficulty in implementation of these ideas. The writer also expressed another shared (with Sibal) surprise. Sibal had to remind the VCs about their big miss on recommendations on the reform of the examination and admissions processes. I think the first audit that must be immediately done is of the skills of our educators, their credentials and contributions – whether in government or outside. Apparently leadership is lacking. The VCs in the news report are making this statement in the midst of anti-semester system protests by a large number of teachers. Pitroda, Chairman, Innovation Council, India, in the clip on the right, distils his experience and wisdom by saying “Only technology and innovation can save (obsolete) higher education in India” and thinks incubation centres and longer working hours are the key to success. If we don’t have good leaders manning the institutions, we are cutting off our legs and trying to run. Just wondering if anyone has studied how many educational administrators India really has. Off the cuff, about 30,000 would be heading universities and colleges; at the district level, across the 600 districts, there should be 8-10 key people; add about 100 per state others in and across boards, councils etc. (say) 3000 and add in another 5000 in other key positions – that should make it close to 50,000 educational administrators. I think that would be an understatement, but like the number of crows in the city of Akbar and Birbal’s Agra, this is just a guess. We must build an open and structured dialogue that acknowledges inputs globally and presents a cogent forum that represents both problems and possible solutions. It is immediately critical to evaluate between competing Educational Futures for India. Rhetoric will see us missing the boat once again, creating far higher unemployment and divides. There is only the difference of an “i” between “running and ruining” our future. Let us subsume the “I”. My talk at EDGE2011 in Delhi was part of a panel that was presenting different thoughts on cutting edge developments in Assessments. I specifically focused on the tracking data, metrics and corresponding analytics that could be found by using games and simulations (or blends of the two). 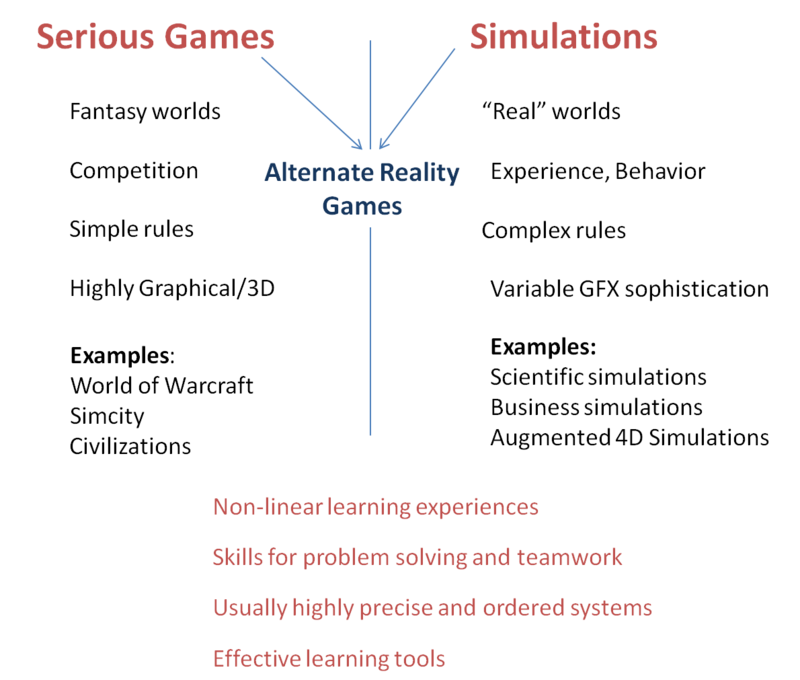 When I talk of Games and Simulations, I typically classify and differentiate between various types in the following sense. For me, leaving aside gaming for entertainment genres, games and simulations are a rich source of tracking virtually any kind of learning activity, experiential or intellectual. Some domains may be extremely abstract, of course, and not lend themselves to any clear ways of assessing learning. There is also the argument that games may not lend themselves to clear linkages with performance on the job. But, in essence, games and simulations allow learning and assessment solution designers to build rich reflective environments from which we can make informed judgments of performance. For simulations and games, as also for Alternate Reality Games, the real complexity is in the design of the environment – the complex of objects and their changing relationships with each other – which by itself is also a dynamic emergent phenomenon. 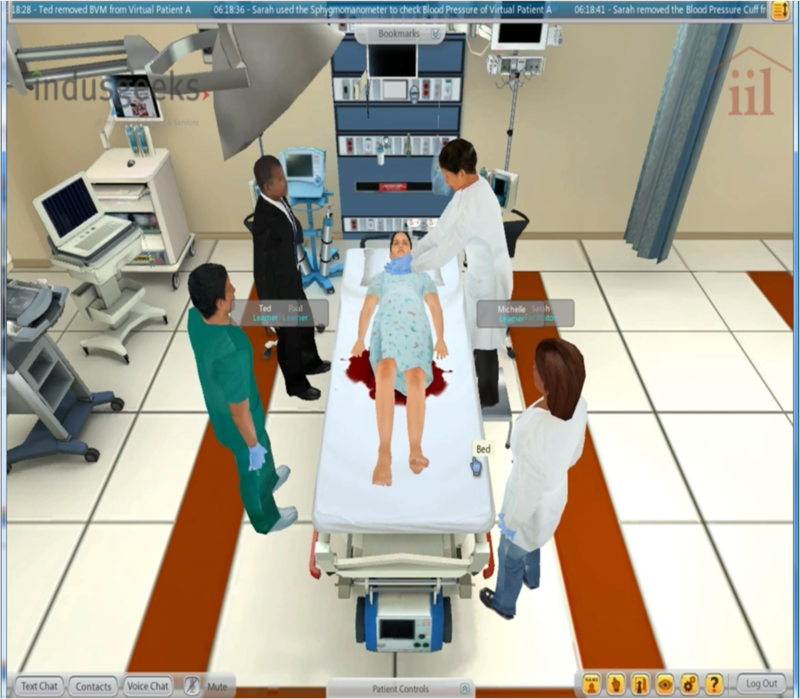 Take for example this hospital simulation developed by Indusgeeks and IIL. This simulation is built up upon a complex environment of objects and their relationships within the added affordances of a Virtual World environment. There are some key advantages of these types of simulations. Firstly, since the platform is that of a virtual world, players can visually observe the behaviour of other participants in the same scene. This lends itself to a way in which player behavior can be assessed and feedback provided. This is critical to solve many infrastructural challenges. LABs are expensive to build and maintain in a physical world and there are space-time limits to intervention by teachers. In a virtual world, actions can be recorded – thereby not only breaking the time challenge, but also by enhancing the teacher’s ability to capture and display best practices. Not only that, it allows teachers to personalize feedback by being part, directly or indirectly, of multiple virtual spaces concurrently. 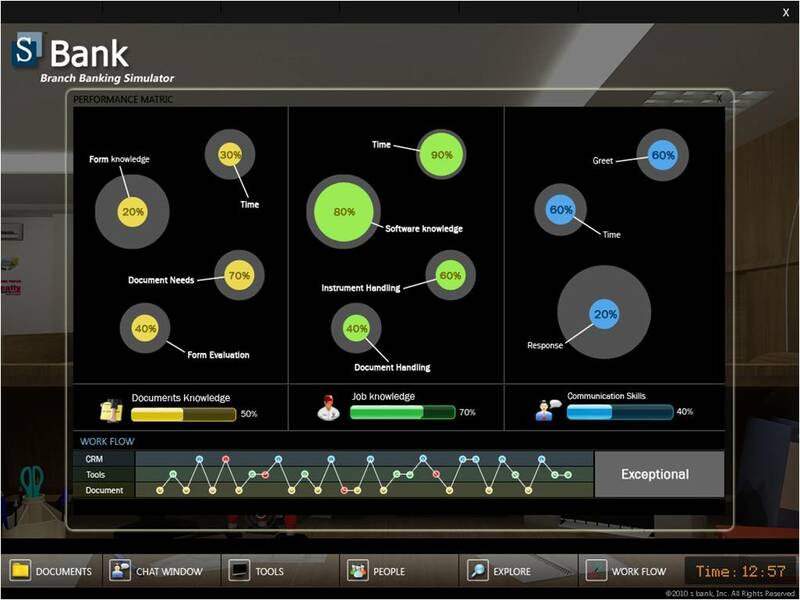 Imagine having a set of consoles at the command of a teacher – each monitoring a specific LAB – that would show indicators when a student is stuck or making a serious mistake! Secondly, the scenario can be manufactured. 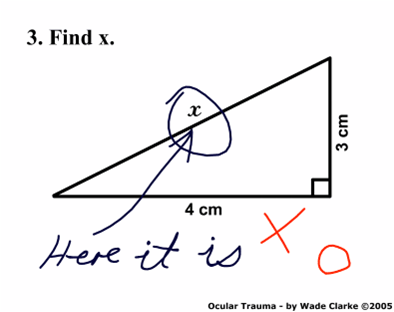 Often, scenarios can be constructed that are difficult to replicate in real life. But artificially manufactured scenarios, provided they are sufficiently hi-fidelity, can provide an intense learning/assessment experience. By virtue of this manufacturing activity, the domain knowledge is exposed in a substantial manner, thereby supervening the need for elaborate teaching artifacts and curricular structures. Thirdly, by being visually (and otherwise) immersive, these types of simulations provide a first-hand account of future real life experiences. This gives much more comfort than traditional assessments, specially to the potential employer, because she knows the learner has experienced the job situation even before she has been hired. Fourthly, simulations lend themselves to new forms of collaborative construction. 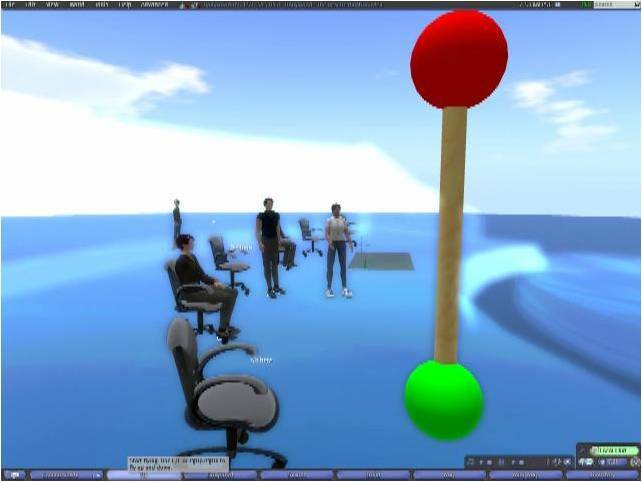 For example, we built a prototype with Indusgeeks, that showcased how virtual props could be used in SecondLife ( a virtual world platform) so learners could collaborate and perform. Fifthly, the environment can throw up rich data sets for subsequent analysis. Not only can we track behavior, but also compliance, knowledge, collaboration skills and a host of other competencies. Not only can we do it for one learner, we can do it across learners. We don’t any longer need to build top and bottom performer reports, but we can get insight that is far more fine-grained than that. This allows us to design various means of remediation as well by seeding simulators with specific conditions to train and test learners on. In summary, simulation based training and simulation based assessments, are both key innovations, that must be broad-based into education. This has the power to transcend traditional curricula and assessment structures if used in a relevant and maximally effective way. TEDxSPSU was held on March 12, 2011 at Sir Padampat Singhania University, Udaipur, India, with the theme Order from Chaos. This series of posts are what my TEDx presentation was based on. This is the last part – Part Six. Meeting scale with scale means leveraging the diversity, passion and insights of a very large number of people to solve a very large problem. This means we need to move some of our focus from hierarchies and ordered structures to open and distributed networks. My concept of learning would be analogous to drinking at a giant watering hole. It’s having all sorts of people and resources coming together to spark off conversations, not unlike this TED conference, united around a common theme. Except that there is no single watering hole or TED conference that I could point to as being the site for learning. It’s chaotic, it’s messy and it requires an altogether different set of skills to navigate – skills such as critical thinking, problem solving, reflection, communication and adaptability, rather than rote learning and subservience to the exam. Sort of like the real world. We think personalizing the learning experience is tough, if not impossible. We think scale is impossible to solve without orderly structures. But perhaps it is possible to leverage both personal learning experiences and the enormous scale itself to find someone who teaches or learns the way you do or aspire to do. I call this, not un-ambiguously but rather simply, Network Based Training or NBT. My belief is that we are moving to a new evolution in online learning just like we moved from a CBT to a WBT with the advent of the world wide web. The NBT is a way to network people and resources around a learning topic. No one theme or person or resource or process of learning is supreme. Unlike a WBT, which is individual and generic, the NBT operates in a networked and personalized context. Unlike a WBT which is visually and instructionally programmed for an assumed closed context, the NBT is open, distributed and rich in diversity. Unlike a WBT which is built for predictability, the NBT is built for encouraging complex behaviors required for learning. We need to go local and global. These networks will be local, seeded by local communities, their skills and needs, at the same time be federated to align with regional and national goals and connected with a global environment. We need to allow these networks to self-organize and self-regulate. Instead of funding centralized initiatives, we need to fund and empower local initiatives. Instead of building cadres of educational bureaucrats and technocrats to staff superstructures, we need to invest in building an Architecture of Participation across these networks so that they are equipped to take decisions about how education should be. We need to build multiple paths to specializations allowing our children to learn at their pace and for the needs of their communities and disciplines. And really importantly, we need to reduce the amount of content we use in our classrooms drastically – shift focus a bit to the experience from just the knowledge – a state of learning to be rather than learning to know. This is a model that will truly democratize education – make it by the people, for the people and of the people. The model will scale. It will recognize local constraints, indigenous capability and meet the aspirations of local communities. It will be sustainable since it is bottom up instead of top down. It will adapt faster to national planning needs. It will create opportunities for innovation and growth. And in doing so we will move from a conception of Education as a process to create the learned to a conception of education as a system that fosters learners. What will this take? Firstly it will take awareness building. Secondly, it will take capability building (not only leadership for the community, but also the vital skills deemed fit to make education a high quality practice). Thirdly, it will take creation of formal structures or spaces where communities can be seeded and supported. Fourthly, it will take a shift of control and a corresponding alteration of the power structures. Fifthly, it will take the loosening of barriers – legal or procedural – to promote freer flow of resources through the local systems. Maybe we could evaluate how education could be made a social business. We need to explore the chaos that can continuously upset the existing desire for order. Hopefully I will be able to see my son, Sambhav, who is 5, taste a bit of this change before it is too late. I would like to end with a visual that I have come to love. It’s symbolic of many of the things I have talked about today. Another news item provokes a sense of deja vu. As part of the EDGE2011 report, I had pointed out the dismal state of affairs in collecting and analyzing educational data in India. In Higher-Ed specifically, the HRD ministry is undertaking a unique, first of its kind survey to collate data and to update it on an annual basis. The task has been entrusted to NUEPA. I am sort of hoping it won’t be the same as DISE. Yash Aggarwal, NIEPA (why does this exist at all if NUEPA exists or vice versa? ), has an undated (I am presuming less than a decade old) report on the Revitalisation of Educational Statistics In India. DISE makes substantial use of the technological advancements. But its main weakness has been inadequacy of M.I.S. staff. Imagine that! The system is broken. I am wondering though what would happen to the National Assessment and Accreditation Council (NAAC) reports on Higher Education? They have an elaborate review system that include peer review and an appeals system. 1. Setting and maintenance of educational standards. 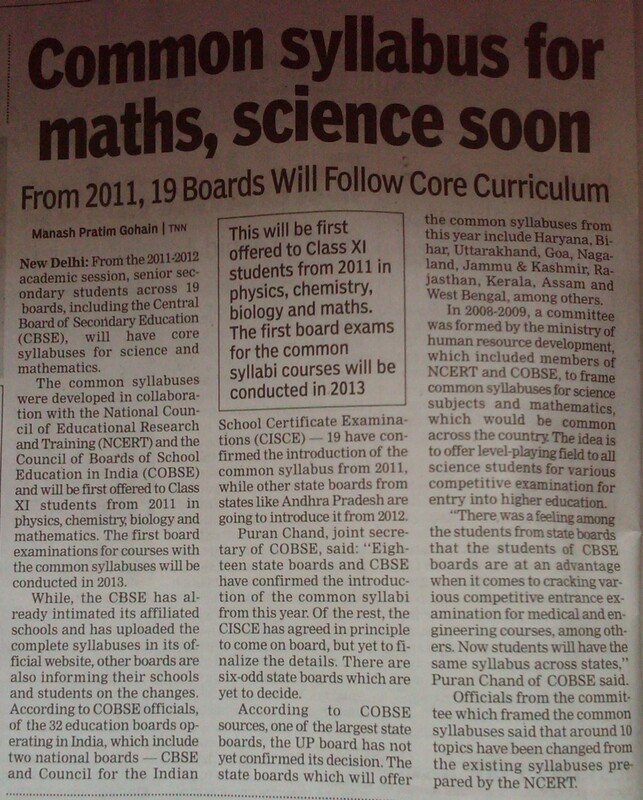 (ii) Curriculum reform and improvement in evaluation systems. (iii)Respond to national concerns like Population Education and Disaster Management. (iv) Professional Development of officers of the Members-boards. (v) Interactions with NCERT / NUEPA on Professional issues. Interesting…they have been around since 1979 and have just 12 publications (none of which are online). Do check out their news page. In March, 2010, there was an article outlining some dissent by prominent people in the NCERT and NCTE stating there was a duplication of effort. Here is Kapil Sibal, Minister, HRD’s 2009 speech to COBSE in case you are interested. I would love to see Kapil Sibal strike a similar vein as James Hacker trying to tackle the excessive British administration and Sir Humphrey. Of course, would like to see strikingly different results! 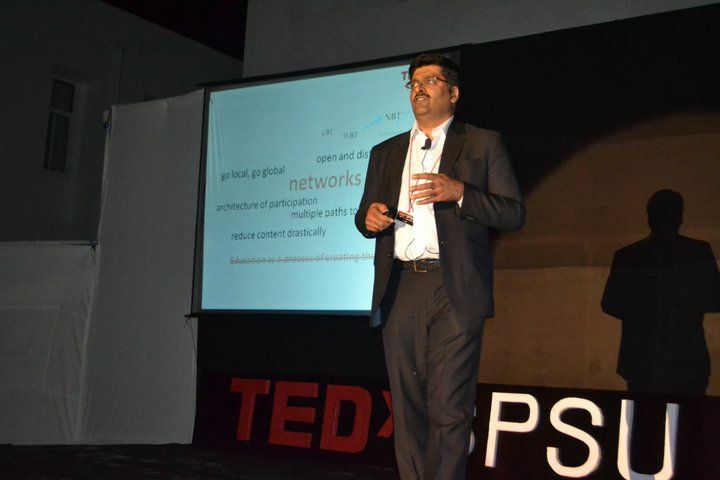 TEDxSPSU was held on March 12, 2011 at Sir Padampat Singhania University, Udaipur, India, with the theme Order from Chaos. This series of posts are what my TEDx presentation was based on. There are six parts that shall be published sequentially over the next few days. This is Part Five. We all like order. We love order. Order means getting dinner on time, flights without delays, people not jumping the queue, police to keep criminals in check, doctors to give the right medicine, politicians to govern responsibly, teachers to teach well….the list is endless. On the other hand, we all hate chaos. Chaos is messy. It is unpredictable. It cannot be controlled. It creates confusion. And my belief is that rather than wanting Order from Chaos, it’s time we started wanting more chaos from this order. I am not saying we address deficiencies in the system we have conceived. Rather I am saying that we ought to question our conception of what our educational system is. In fact, by the early 20th century, people started looking at phenomena that could not be described by this classical, ordered view of a system. There were many phenomena, they argued, that did not fit into this classical notion of order – there was an element of probability that threatened the concept of order and predictability. For example, weather is impossible to predict in detail, but general patterns can be observed and predicted. This started work on what is called Systems Theory which focused on “arrangement and relations between parts which connect them into a whole”. Some of the earliest work in this area was from people like Alexander Bogdanov, Ludwig von Bertalanffy, Norbert Weiner (who founded Cybernetics in 1948) and von Neumann. Cybernetics concentrated on the interface between man and electronics particularly for mechanisms of feedback, complexity, self-organization and adaptation. The basic ideas around systems theory was that all around us we have systems or models that are complex. They are complex because they are made up of elements that have strong relationships with each other and with the environment in which the system exists. What is interesting is that none of these elements completely describe the system they are part of and looking at their behavior may not provide us a deterministic way of predicting the behavior of the system as a whole. For example, a gas particle is defined by its position and velocity. However the gas has properties like temperature and pressure. Not just that, under different environmental conditions, the gas may exhibit entirely different sets of properties i.e. new behavior may emerge. All the birds in the flock follow these simple rules, but as you may have seen, their collective behavior is unpredictable and does not repeat itself. Or the music produced by a jazz band, in which members agree to obey some general rules but are free to create their own variations, producing impossible to predict music. What’s more, members of the band may be influenced by their environment (e.g. changing audience preferences) and adapt their music in unpredictable ways. One of the most amazing phenomena to be studied is Chaos. Small changes in initial conditions could lead to very large differences in outcomes. This was first found when Edward Lorenz studied weather patterns. Since the elements of a system are networked, there is a huge value in deciphering patterns of behaviours in a network. For example, organizations are built hierarchically. But the way work gets done in the organization resembles a network. Stakeholders are connected to each other in multiple ways spanning across traditional silos in an attempt to get the job done. We observe that information has many cores of distribution, not just one. We observe that an individual when replaced in an organization changes the network structure and consequently some of the efficiencies in the system, especially if she is a link between multiple sub-networks. It has become apparent that closed-loop predictable systems are just one form of a system that exists in real life. All around us we have systems or models that are complex, open and distributed. They are made up of networks of elements that have strong relationships with each other and with the environment in which the system exists. Like the educational system. These systems exhibit very interesting behaviors. As the environment changes, these systems adapt. Small changes in initial conditions bring about large changes in outcomes. New behaviors emerge rather than being designed to occur. Not only that these systems do tend to self-organize and self-regulate. Some of this work also inspired the thinking around the early web. Joseph Licklider wrote about man-computer symbiosis in 1960, extending from Norbert Weiner’s work on Cybernetics. Licklider wrote on the Computer as a communication device in 1968, where he saw the universal network as a network of people, connected to each other, and producing something that no one person in the network could ever hope to produce. Lick’s efforts led to the creation of the first Internet. The rest is history. The ARPANET emerged in 1969. By 1990, Tim Berners-Lee had created the hypertext transfer protocol (http) which marked the birth of the web, and the internet started growing exponentially. By 2005, Tim O’Reilly had marked another phase of the evolution of the Web and called it Web 2.0. While the earlier web was about connecting people to resources, this web was about people being able to create their own content, search it, share it and digitally collaborate. It was about harnessing collective intelligence ushered in by Amazon and its recommendation service. The last 5 years or so have seen tumultuous development on the Internet. Neuroscientific advancements are also pointing to a different conception of the brain – not as an information processing unit, but as a system of massively parallel and networked connections. Symbolic language is being considered to be at a level higher that what occurs in the brain and that has important consequences for the way we treat the written or spoken word. Analytics have changed in turn – there is a move from analyzing relationships to analyzing underlying patterns in a huge and growing, now digitally available, data, also called BIG data. There is an even greater change that is looming on the horizon – that of the Semantic Web. Web 2.0 is collapsing under its own weight. The gigantic amount of information that is being created everyday is burying search. This is a really important development. So instead, we are moving towards Web 3.0 – the promise of a ubiquitous, semantic, location aware and contextual web – that Tim Berners-Lee originally envisaged. But in our quest for ORDER, we have consciously excluded precisely this kind of emergent, self-organizing, chaotic, adaptive behavior. And I believe we need to correct this. Once we shift that perspective, powerful alternatives emerge. And one of them could be to challenge scale with scale itself.